We can’t believe it’s that time again! Christmas is almost upon us and while we are enjoying the festivities here in the UK our thoughts also turn to Russia. Christmas is actually celebrated there on January 7th, at the end of Advent which we mark from November 28th until January 6th. Since the end of the Soviet era, the Christmas celebrations in Russia have experienced something of a renaissance. 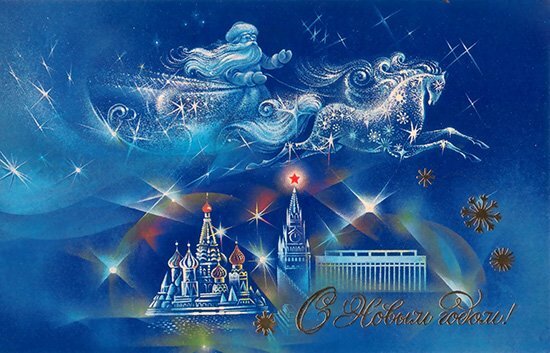 С Новым Годом, с новым счастьем! – To the New Year, to the new happiness! Afterwards, champagne in hand, it’s time to party and of course, you’re welcome to join us. It’s a great time of year to be in Russia: with snow on the ground and with a little luck, clear blue skies to allow the sunshine to add a little sparkle, the unmissable sights of great cities such as Moscow and St Petersburg will be at their best. A few days later, we’ll toast again: C рождеством! – Merry Christmas! A feast is prepared. On Christmas Eve, it’s not the norm to eat meat. Instead we’ll start with a kind of porridge called sochivo (or the similar kutya) made from wheat, topping it with honey, berries, walnuts and poppy seeds. Traditionally, it’s shared from one bowl, to demonstrate that we Russians stick together. Another tradition is to throw a spoonful at the ceiling, generally initiated by those who have no intention of taking on the cleaning, as it’s considered good luck if it sticks. Later, we’ll eat borsch, our famous beetroot soup, or another soup called solyanka, then salads and sauerkraut. If there’s any room left, someone can be relied upon to produce a plate of gingerbread or honeybread cookies. Finally we drink a glass of vzvar, hot water infused with a sweet mix of honey and dried fruit. We still have one more celebration to enjoy before we go back to work. Old New Year is marked on January 13th using the Julian calendar that predated the current Georgian calendar which came into effect in 1918. With so many holidays to choose from, we’re sure you can time your visit to include at least one. Happy holidays!